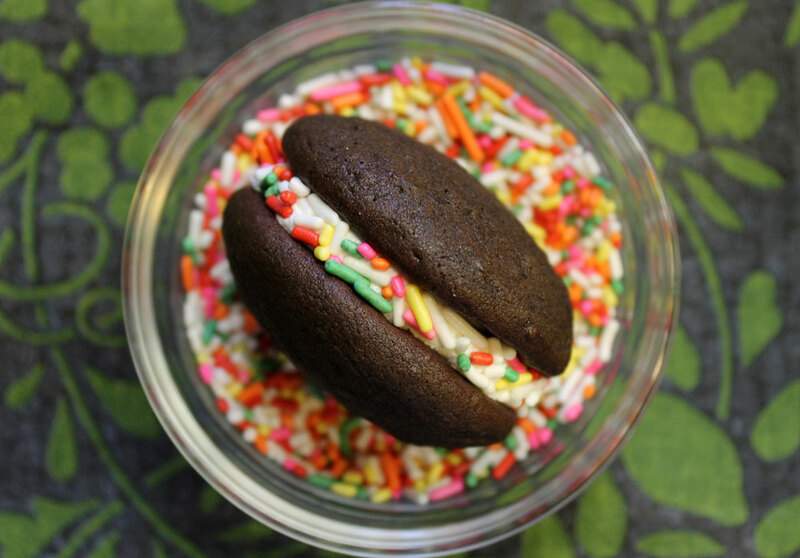 Eating a whoopie pie is a bit like enjoying your own piece of cake, minus the crazy amount of frosting that usually comes along with cake. And much like cake, you can find and make an endless flavor combinations. 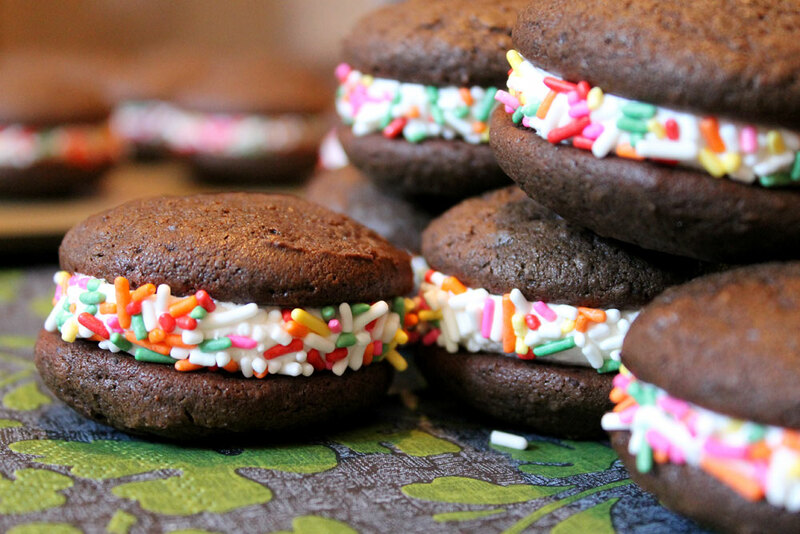 I made these whoopie pies a co-worker who wanted chocolate and vanilla, so this flavor combo is pretty straightforward, simple, and delicious. I’m saving those Elvis-inspired, banana cake, peanut butter filled, bacon bit sprinkled whoopie pies for another time. To get started with these bites of sweetness, the chocolate batter is made first. 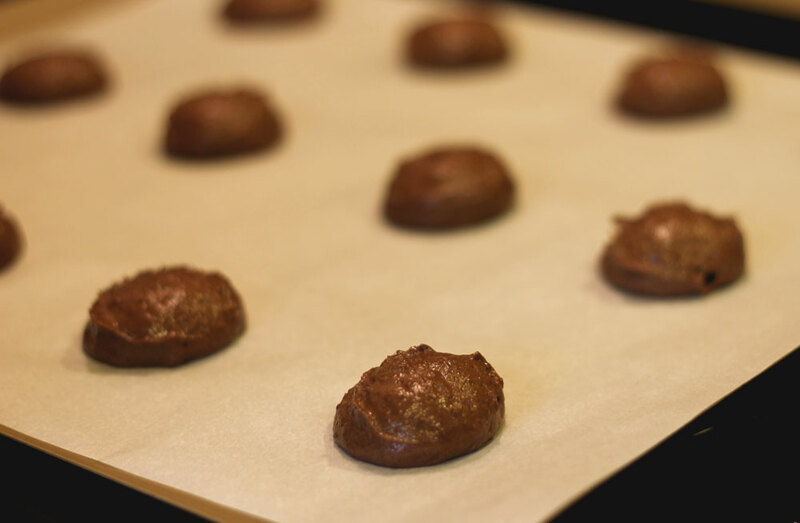 Once the batter is ready, just drop it by spoonfuls onto prepped cookie sheets. The spoonfuls of batter should be about two inches apart as they will definitely spread as they bake. Special whoopie pie pans can be purchased if you’re crazy obsessive and NEED them to all be EXACTLY the same size, but they’re not necessary. As long as your spoonfuls of batter are the same size, they should bake to the same size like these. 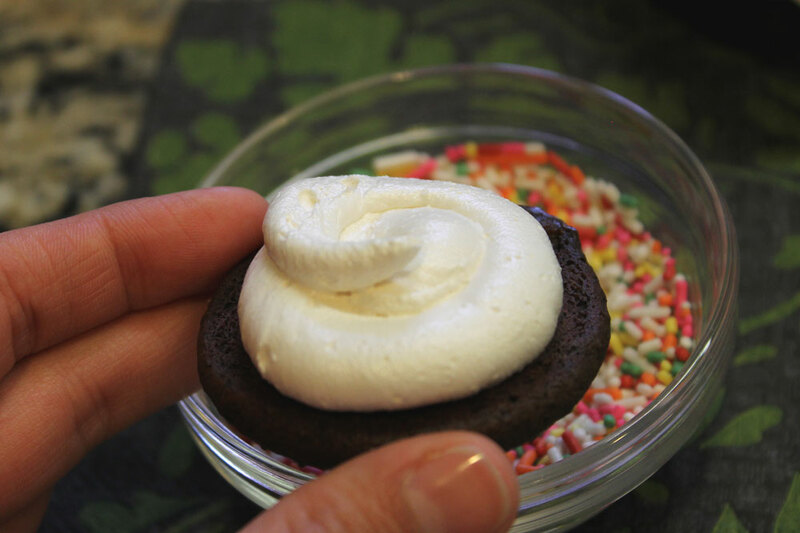 I have a whoopie pie pan as well, but I prefer to bake them them this way. 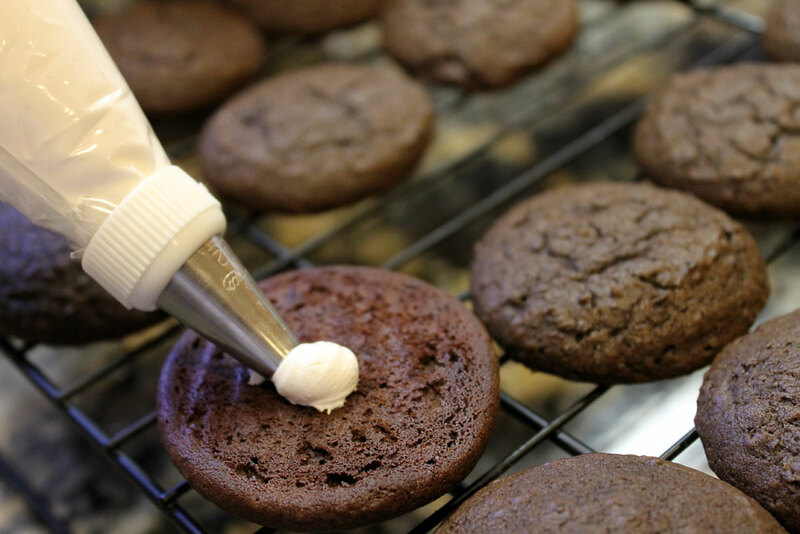 Once the cakes bits are completely cooled, either spread or pipe on the vanilla buttercream. Then roll the outer, frosting-exposed edges in sprinkles. This step is totally optional, I guess, but I love the look of colorful sprinkles on these. The colors are fun and make these impossible to resist. Trust me. Make them. Now. They’re so good. 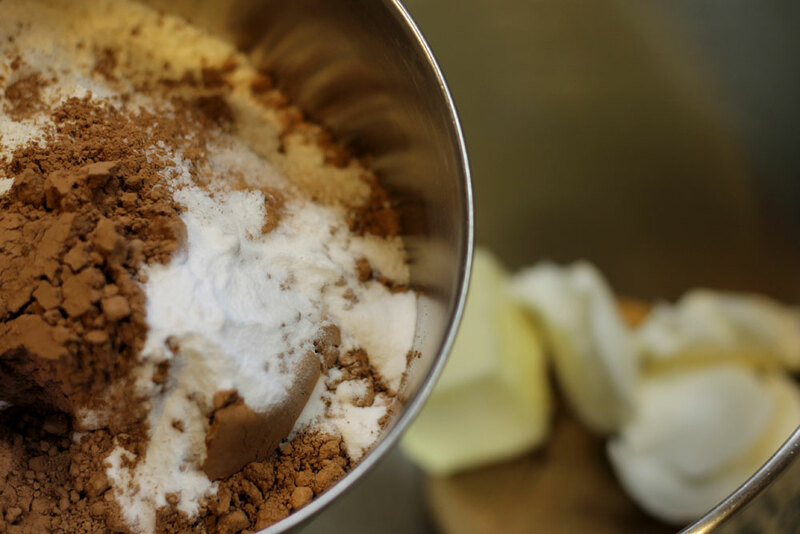 Sift together the flour, cocoa powder, baking soda, and salt into a medium bowl. In a large mixer bowl with a paddle attachment, beat together the butter, shortening, and brown sugar on low speed until combined, then increase the speed to medium and beat until it’s fluffy and smooth – about 3 minutes. Add the egg and vanilla and beat for another 2 minutes. Add half the flour mixture and half the milk to the batter and beat on low until just incorporated. Scrape down the sides of the bowl. Add the remaining flour mixture and milk and beat until completely combined. 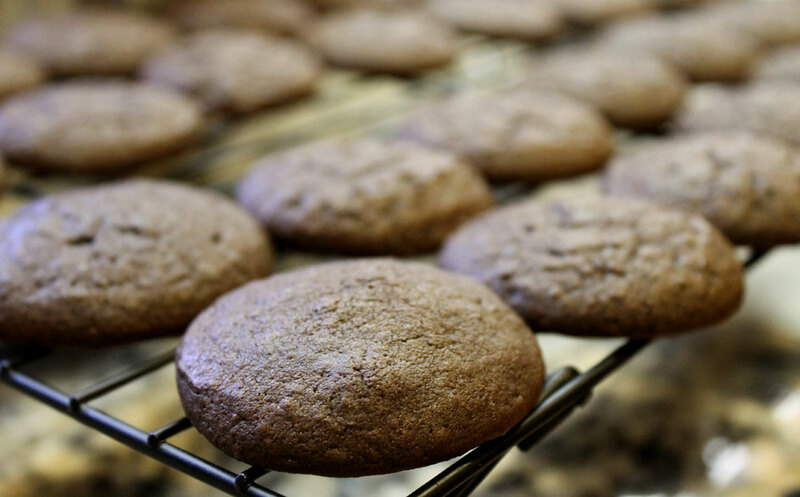 Drop the batter by tablespoons onto the cookie sheets, spacing them at least 2 inches apart. Bake one sheet at a time for about 10 minutes each, or until the cakes spring back when gently pressed. Remove from the oven and let the cakes cool on the sheet for about 2 minutes before transferring to a rack to cool completely. In a bowl, beat the butter, sugar and salt until blended. Add the milk and vanilla and beat for an additional 3 to 5 minutes or until smooth and creamy.